52 Mantels: Hallway Makeover (DIY Board & Batten and Cutting Edge Stencils) + Giveaway! 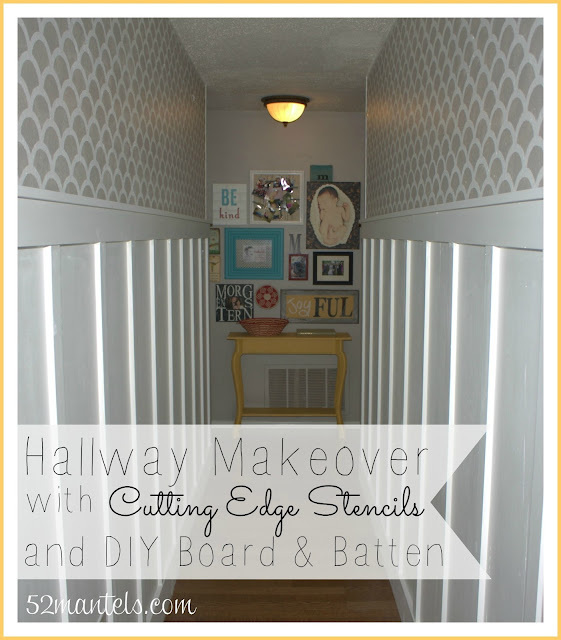 Hallway Makeover (DIY Board & Batten and Cutting Edge Stencils) + Giveaway! I've teased about my hallway makeover on Instagram a few times now. 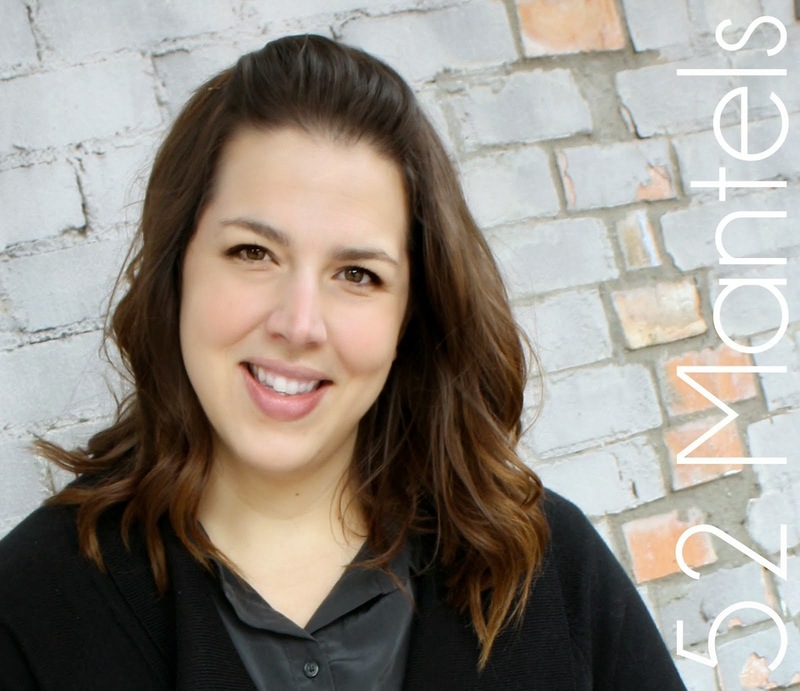 And, I'm so happy to share the (almost) final results with you today! 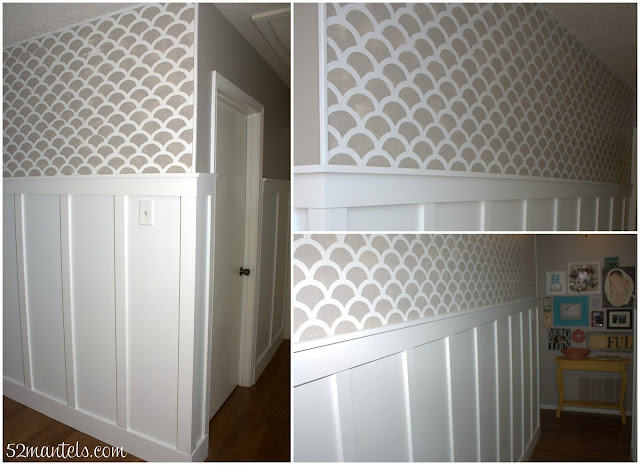 We decided to install DIY Board & Batten and try out one of the fun stencils from Cutting Edge Stencils on the wall above it. 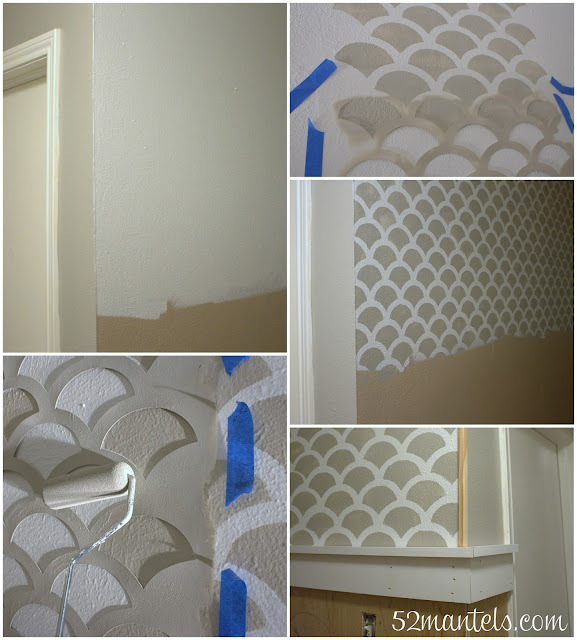 I chose the allover Mermaid stencil and I love the look of it! However, I WILL give you some pointers for using the allover stencil from Cutting Edge. That before shot is embarrassing! I can't believe we lived with that dark, bleh tunnel for 3 years! In truth, the makeover isn't completely done because we still need to change the light fixture and add more light down the length of the hallway. But, the white and gray paint really brightens it up! 1) This may be obvious, but paint the light color first and then stencil the darker shade on. That'll give you better coverage in less coats. 2) Start in an inconspicuous spot, so you can get the feel of it before it really matters. 3) Roll the stencil in paint and then roll most of it off onto a paper towel before putting the roller on the wall. 4) Watch one or more of the Cutting Edge tutorial videos before starting. They are really helpful! 5) If you're doing board & batten too, do the wall stencil first so you don't have to cut in on the bottom. 6) If you're doing feature walls, like I did, consider capping the corner edge with a piece of decorative trim. This isn't mandatory, but it does give it a nice, polished look. As you can see from the above pictures, we wrapped our board & batten around the corners, but stopped the stencil at the end of the hallway. Then we added corner trim on the edge above the b&b. I think the stencil was really easy to use and gives a lot of impact for relatively low effort! You can see from the "before" photo that my gallery wall got a little tweak, too. I'll give you the details of that next week! On a related note, did you see the stenciled rug I shared last Friday? It was a under-an-hour project using a small Cutting Edge Stencil (pssst...they give all customers a small freebie stencil!). So, would you like to WIN $50 to Cutting Edge Stencils?? I thought you might! Use the rafflecopter below to enter! 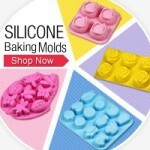 *winner receives one stencil of their choice, up to $50 value, plus free shipping. US residents only. Oh Emily! What a makeover! It's so much lighter and brighter and has lots of new "zing!" I really like this stencil style, too. . I have a few from Cutting Edge and have found them to be very easy to use. Maybe I need this scale-y one for a bathroom makeover I am planning.... Thanks for the inspiration! So cute! I love your how everything you do is awesome but not overwhelmingly difficult. Thanks! I love love love these walls... It's amazing! I might even be able to convince my husband to do this with me and I love your wall hangings too. Adorable as always! LOVE! I'd love the Hermitage Acanthus Coffer Stencil for my entryway. The chevron stencil, hands down! Love your walls and my favorite is the casablanca allover stencil. Love the walls!! The stencil turned out great! I love the stencil level. It was a must when I did my wall. It helped keep everything straight. Love it! Looks fabulous! I love that stencil! There are so many stencils I like, but the Chevron is my fav! 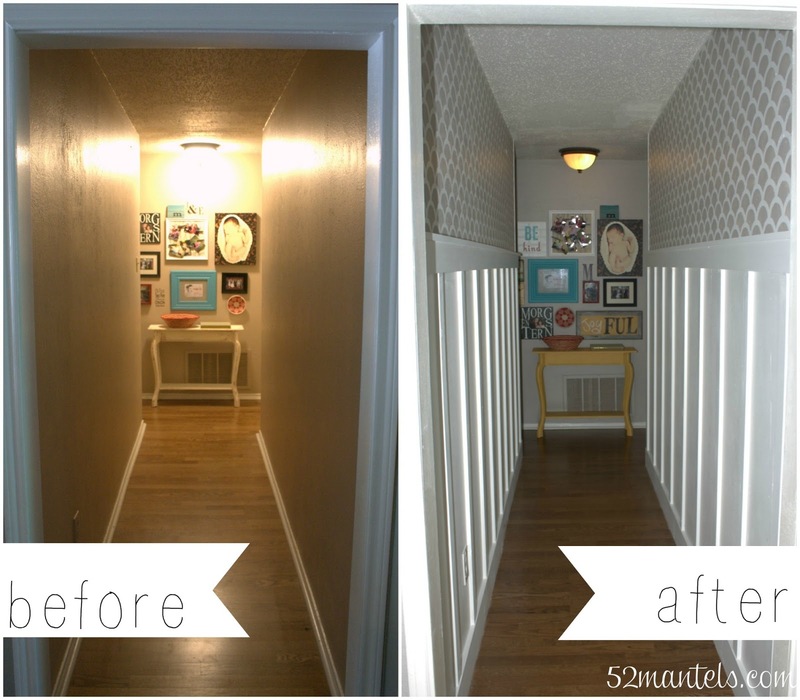 Love how your hallway turned out. I'm inspired to do mine now too!! I would love the chevron stencils!! Wow! What a beautiful hallway! Great work:) I love any of the damask and chevron patterns. Would love one of these for my bedroom makeover we have started on. Thanks! Your hallway looks awesome! I like the Chevron All Over Stencil the best I think. Love the choice of the mermaid stencil. It looks great! I would love to win a stencil and do this to my hallway too! I love the houndstooth stencil! I like the Birch Forest Allover Stencil. Thanks! 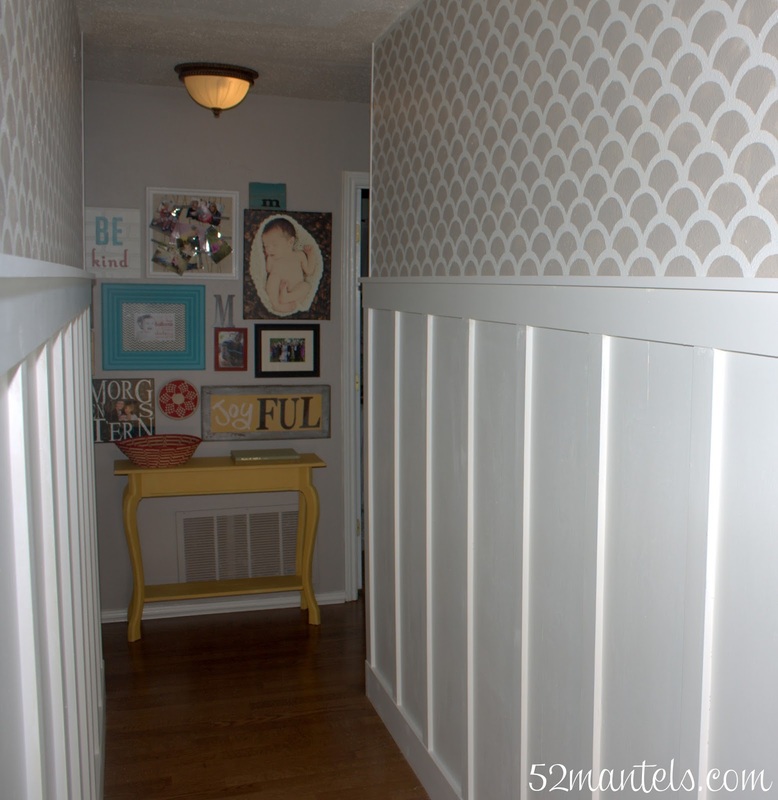 I love the Chevron Stencil and would love to use it on the ceiling in my craft room! The chevron stencil makes me swoon! Love it! I like the mermaid stencil you used. Looks great! 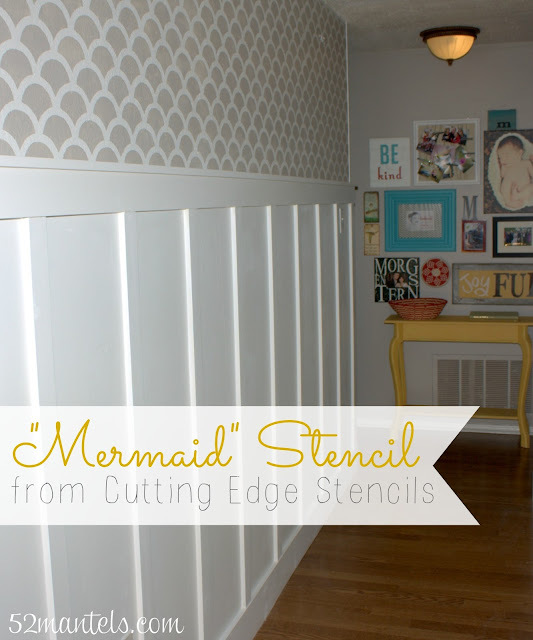 After seeing your finished walls I think I'm the newest fan of the mermaid stencil! I would choose a quote stencil! I would choose a stencil I could layer with. Nice post! Newest follower! This makeover came out so nice! Thanks for hosting this fabulous giveaway as well! This inspires me to get busy!!!! Thanks for sharing. Your hallway is gorgeous Emily!! I would say I have my eye on the Marrakech Trellis Craft Stencil and the same design wall stencil too. Thank you so much for a great giveaway!! I love chevron patterns, so I'd have to go with the chevron all over stencil! What a difference between the before and after! I'm really starting to think about doing some stenciling so I'm pinning this now! I'm stopping by from Tatertots & Jello (#86 DIY Photo Canvas and #115 Spend A Little & Invest In Yourself) Have a great weekend! Thanks for all your sweet comments!! It was a fun product to work with!! Your hallway looks AH-MAZING!!!! Simply elegant, Emily! Emily, the board and batten looks great! I should have thought of this for my master bath. Great job on the stencil, but I would not have the patience for that. Have a great weekend! The Nike KD 9 Gold Medal celebrates Kevin Durant’s and Team USA Basketball’s Gold Medal at the 2016 Summer Olympics Kyrie 2 in Rio.This Nike KD 9 comes dressed in a Dark Obsidian and Metallic Gold color scheme. The shoe features a USA-inspired mixture of Obsidian uppers LeBron 12 with Gold branding and hits of Red on the liner. An icy translucent outsole completes the look.Look for the Nike KD 9 “Gold Medal” to Cheap KD Shoes release on August 22nd, 2016 at select Nike Basketball retail stores. The retail price tag is set at $150 USD. The Nike Kobe 11 gets LeBron 10 ready for the upcoming basketball season with enough colorways for just about any team on the court. The new team-based colorways for the high-performance and LeBron soldier 9 low-top hoops shoe feature the Kobe 11 in white, black, navy, royal, green, and red colorways, ensuring your squad can match up your sneaker and LeBron zoom soldier 9 uniforms in style. The Kobe 11 team colorways are available now at select Nike Basketball retailers like Eastbay.